Gazania plants can tolerate light frosts but not hard freezes. Fast growth is encouraged by mixing a balanced organic fertiliser into the soil before planting. Drench plants with a liquid fertiliser in late summer to support strong blooming in autumn. When starting gazania seeds indoors in early spring, cover them well with moist seed starting mix. Gazanias also can be direct-sown in late spring, after the soil has warmed. 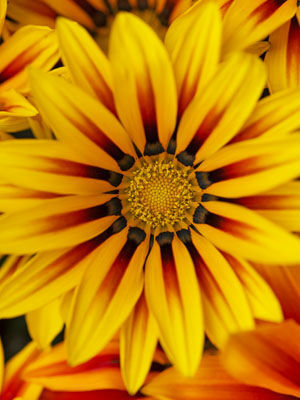 Originally from South Africa, gazania survives high heat better than many other flowers. Gazania colours include orange, yellow, white, pink and many bicolours. Blossoms open during the day and close at night, so they are not useful as cut flowers. Container-grown plants can be brought indoors in autumn and kept growing in a sunny windowsill or heated greenhouse.